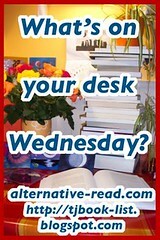 SASSY’S BOOK BLOG MEME: What’s on Your Desk Wednesday? GUIDELINES! 4 Comments on SASSY’S BOOK BLOG MEME: What’s on Your Desk Wednesday? GUIDELINES! What’s on your desk Wednesday? is a weekly bookish meme hosted by Sassy Brit of Alternative-Read.com . Check my blog out each Wednesday for the post titled What’s on your desk Wednesday? You can do one of two things or both! Grab a camera and take a photo of your desk! Or anywhere you stack your books/TBR pile. And no tidying! Add this photo to your blog.Tag at least 5 people! Come back here and leave a link back to your photo in the Mr. Linky. List at least 5 BOOKISH things on your desk (I’m thinking your TBR pile or books you haven’t shelved…) List at least 5 NON BOOK things. (I’m thinking some of some of the more unusual items on your desk/table?) Tag at least 5 people to do the same. Come back here and leave your link, so we can come and visit your blog. Or add your answers in the comments if you don’t have a blog. Feel free to grab the above picture to place on your blog – as a way of showing you are participating, and of course to spread the word! Thank you everyone for taking the time to come here and comment. It’s truly appreciated. I aim to get back to everyone as soon as possible. N.B. For those of you who already know me, you may have spotted that this is a different take on my “DESK DARE” feature, only I’ve smoothed it around the edges, given it a new look – it’s the same thing, just more refined. 🙂 Check out these flickr photos! Also, please don’t feel pressurised into tagging, just do what feels right for you. The main aim here is to have fun with this. What a fun idea! I know you have been doing this a while but I've just started my own book blog and found yours along the way. I think your blog is great too, one of the most fun out there! Thanks for your kind words Book Chick. It's great to meet you. If I can be of any help just shout! Hello there! I was tagged by Yvette from True Crime Book Review and I played along. I am here to let you know that mine is scheduled to post tomorrow at 6am (CST) for me. Not sure what time zone you are on. Here is my link to my home page. I hope you enjoy it, I enjoyed doing this. Cool idea. My desk is such an organic being (a messy organic being, mind you), I could play along weekley and it would never look the same. LOL! Next Entry SASSY’S BOOK BLOG MEME: What’s on Your Desk Wednesday?